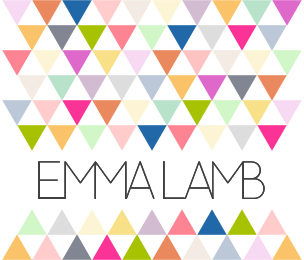 emma lamb: studio details : cosy for the winter! studio details : cosy for the winter! Hello my lovelies! 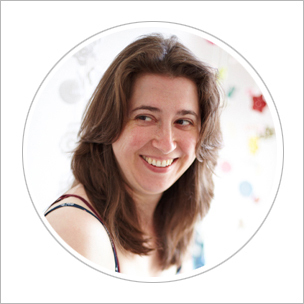 Remember my Folksy interview from last week? 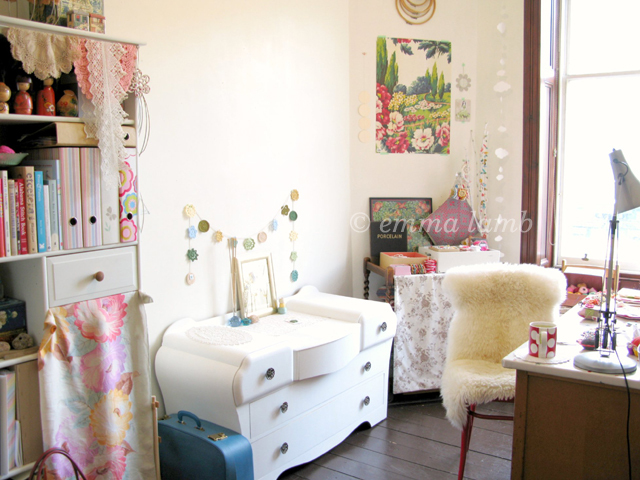 Well here are a few more photos of my cosy wee studio they didn't use. I took them on one of the sunniest autumn days ever, the light in my studio looks amazing on days like that as it creates such a beautiful warm glow that makes every colour seem so much more vibrant. The absolute best place to work ever! Above: Bertha, my old dresser rescued from the street outside my window, has been painted a bright white and is now in my 'photography spot. The best place in my studio for photographing all my ladies, the light is just right there... at least it is when there is light to be had, which is not so much at this time of the year. Above: My most favourite inspiration of the moment. 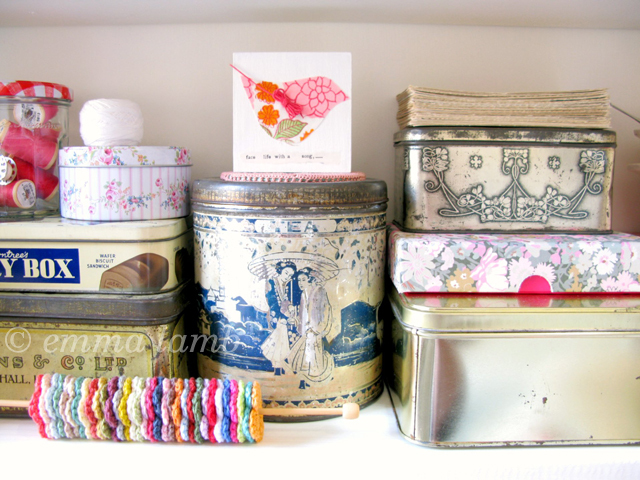 Lots of fabulous vintage gold tins that are home to my buttons stash, spools of thread and lovely embroidery threads. I adore lots of gold mixed with bright pinks, orange and deep cobalt blues shades at the moment. Oh and a wee bit of a Liberty print is always a bonus! Below: My 'wrapping and packing' station. 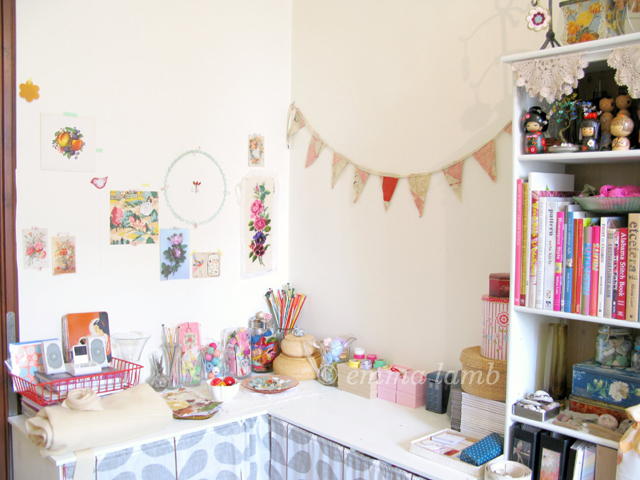 A month or two ago I reorganised my studio to create this wee space and to be honest I can't tell you how I ever managed without it! 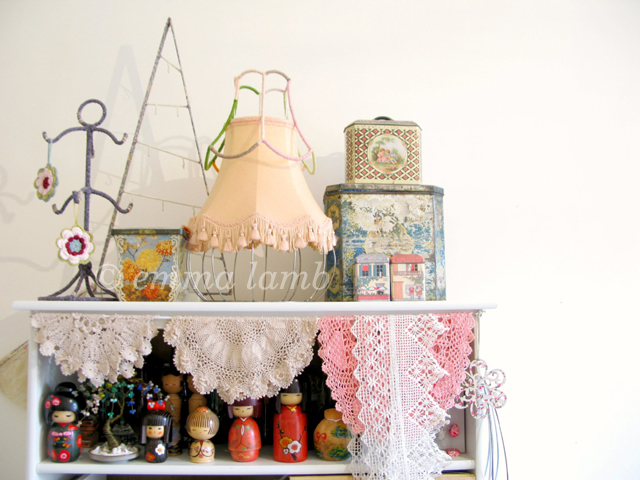 The wall space under the gorgeous vintage quilt bunting (by enhabiten) is perfect for pinning my order sheets; the unit below holds all my wrapping papers; I have piles of pretty tape and baskets of yarn along the top and a wee box to the side holding pens and customs forms, etc. Everything is to hand just where I need it... perfect! The only thing is... since that last reshuffle my inspiration wall has been relocated and is much smaller. I'm telling myself that this will be better as I will be more selective about the pretty bits I choose to display instead of slapping everything up there. It also means I'll be a wee bit more frugal with my precious washi tape! so nice to see this room. 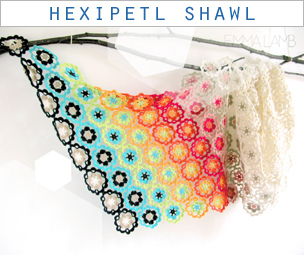 I like the colors and the ideas. great. That white dresser is AH-mazing!!! Just look at that gorgeous little man peeping out from under the desk!! thanks for the tour~what a beautiful space! What a wonderful room. 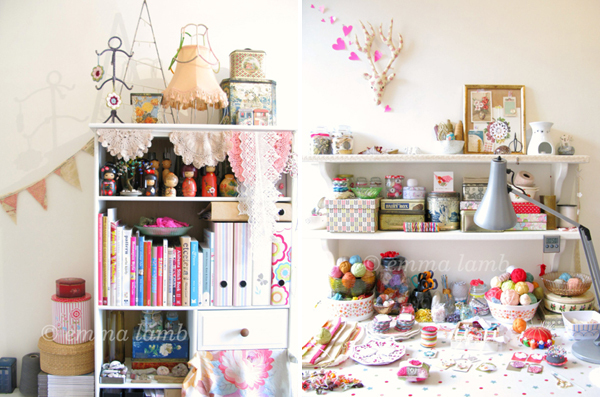 So bright and cheerful, the dresser is amazing. Great find. 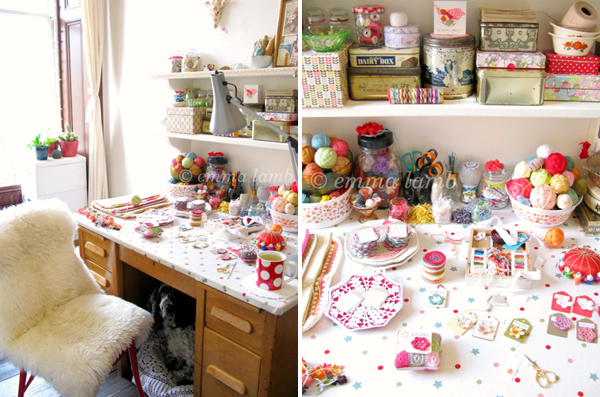 Emma, thanks so much for a glimpse of your studio. Yes...with enough sunlight, the warm glow of light is lovely. 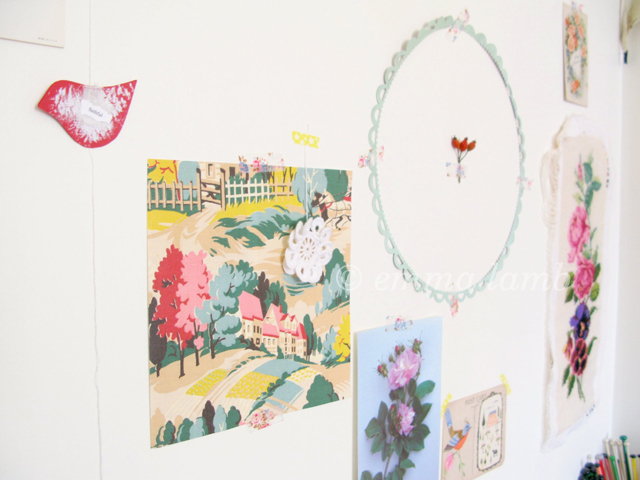 The airiness would surely encourage all sorts of creativity...and the inspiring mood boards and little ephemera just add up to a wonderfully Emma-esq atmosphere.